It is with great sadness that I have to inform you all that Davie died yesterday evening, his heart just had enough. It was a big heart and always full with his love and passion for our country. He was so proud of what has been achieved and where he saw the future lying. Sadly, he hasn't lived to see the freedom and liberation that Scotland will attain, but I know he'll be up there with Wallace, the Bruce, the Douglas and all the other great patriots of our country giving it yeeha when Scotland is at last free! Davie has unfinished business - the Wallace coffin, 2014 to note just a couple that both Kimmy and I want to conclude on his behalf. We will call on you in the future to help attain these dreams and make them the reality that he would have done. I hope you will help us realise that. Today I have lost a true friend, Scotland has lost one of her finest sons. He was a giant of a man in so many more ways than his physical stature. No man loved his country more and he made sure everybody knew it with an incredible passion for both its history and its future. I feel humble and priveleged to have been a part of his life and to have been asked to be part of William Wallace's funeral service in 2005. I hope he knew just how much it meant to every one of us there that day. He had so much more he wanted to do, so many plans. We can never replace his presence, knowledge and friendship but through his books, words and actions he left a legacy that continues to inspire thousands of people to acknowledge who we are as a nation and to share in his dreams. It now falls on us to carry these dreams forward. Sleep well Big Davie - we will not let you down. I was having a sad look at David's website this morning and was really struck by the words he recently penned regarding an oath for the saltire. Read again they seem so fitting to the great man himself. “I stand before this flag. The white Saltire of St Andrew in the blue summers’ sky. It represents the soil from which I sprang, and to which, one day, I must return. What a shock - must have been sudden as he always appeared very fit and healthy. The Society, and indeed Scotland, has lost a great patriot and a bonnie fechter for the cause of freedom. It's incumbent on those of us who yearn for our country's independence to continue the good fight. I am absolutely shocked..... cant believe it. Very sad to hear of the passing of David, as you say he will be sadly missed by all of us. I will attend the Funeral with any Members available, will give you numbers ASAP. God sake! please accept my deepest and most sincere condolences. He will be sadly missed but I am sure he will have been welcomed at the gates by Wallace himself. Rob Gibson MSP, convener of the Andrew de Moray Project, has expressed the project's condolences on the death at 51 years of age of David R Ross. David's work in promoting the place of William Wallace the patriot of the Scottish Wars of Independence starting in 1297 has been a modern phenomenon. Rob said, "Scots have been made much more aware of their history thanks to David's work. He was an early supporter of the Andrew de Moray Project who spoke at our gatherings at Ormond hill, Avoch on several occasions." "Through David Ross's work for the Society of William Wallace we were able to work in partnership with them to celebrate both Wallace and Andrew de Moray his co-commander at the Stirling Bridge victory. David's march to London in 2005 caught the imagination of many. He spoke beside Alex Salmond the SNP leader in Westminster Hall where Wallace's trial took place seven hundred and five years before." "Highlanders will want to remember David R Ross's work and his books such as 'On the Trail of William Wallace' which mentioned the cairn and flagpole at Ormond Hill. A motion of condolence was lodged by Sandra White MSP." I am truly stunned at this very sad news about David and I have tears in my eyes. I had the great pleasure of meeting David on two occasions when he was in Canada and the USA . He kindly signed one of his books for me at the Fergus games in Canada, in 2002. The book was a "A Passion for Scotland" and he wrote these words " To Andy Barclay a Kindred Spirit"! My great passion is Scottish history ad especially the Wars of Independence. I am descended through the same line as Sir David Barclay. Lord of Cairny. He wasa close associate of Wallace and Bruce and he was killed at Bannockburn on the second day of the battle. Big Davie will be sadly missed. Please express my sincere condolences to his family and to the members of the Wallace Society. I am sadened and dismayed to learn of David's passing. 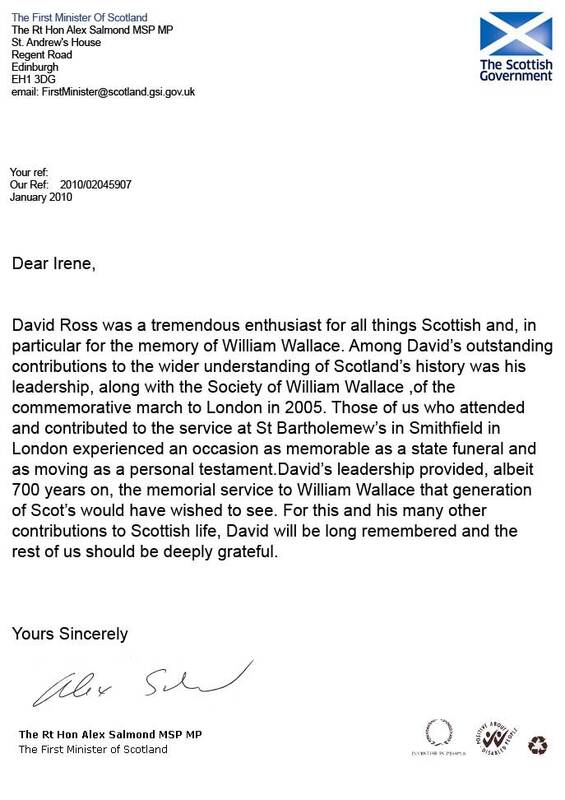 If anyone epitomise the spirit of our great hero Sir William Wallace it was David R. Ross. He was an undaunted fighter for the upholding of the memory of Wallace. I once attended a wonderful illustrated talk in Dunfermaline delivered by David. At the end of the talk (the hall was packed by the way) I went up to him to congratulated him on the talk. His response was, "Someone has got to do it." How right he was but who now can carry the flag forward? Bryan Cromwell (Scotland born, bred, and nurtured). ALBA GU BRATH. 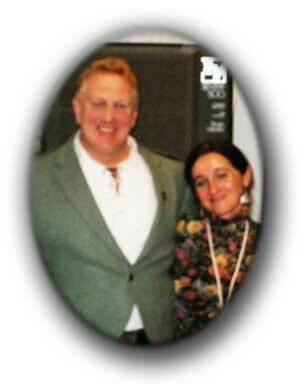 I was saddened to learn of the death of David R Ross on Saturday, January 2nd of 2010 at the age of fifty-two. The Clan Ross Association of Canada expresses its sincere condolences to David's family & the Society of William Wallace, of which he was the convener. Our thoughts and our prayers are with all of you. 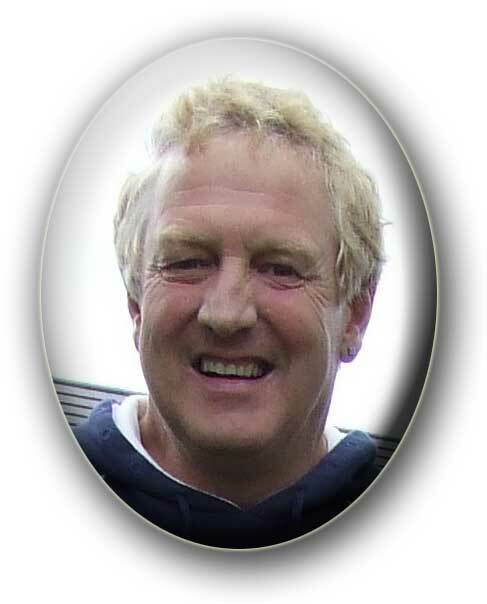 I thank our Clan Ross Canada president, Andy Thibodeau, for emailing an obituary notice after David's funeral. I know this might not be too much use Doug, but as someone who lives in Scotland, the prices you are looking at are probably "without VAT( value added tax)" and then "with VAT" I dont think the VAT price will be bigger than the hire price. VAT is usually the net price plus 17.5%, so im assuming that one price is without VAT and one with. I have to add that this gathering is not well known in Scotland. There has been very little, if anything at all in the press here, but then they may not cover it till much nearer the time, whereas the actual participants ( yourselves for example) will have to be notified well in advance. Other than that, i hope life is treating you well, and i hope all goes to plan. Ive just finished a new book on the Black Douglas, a hero from the Scottish Wars of Independence, and am currently making a program for the History Channel in North America, entitled "Warriors". Convenor, Society of William Wallace. You may see the coverage of his recent 2006 visit to Fergus, Ontario, HERE. David brought his daughter on an earlier visit, and we were immediately impressed most favourably. It was very sad to hear of David's sudden departure. He obviously had a calling. Perhaps as his work is complete here and he is needed on a higher level. All my thoughts are with his family at this very difficult time. We stand together today to pay our respects to one of the greatest patriots Scotland has ever had the privilege to call one of her own. This country has lost one of her greatest ambassadors for her history & heritage, & we have lost a very dear friend. Davie was a fine author, historian & raconteur, but he also had a razor-sharp wit & a wicked sense of humour. I think that’s why we got on so well. His passing leaves a void in our lives that can never be filled. He often referred to himself as “that Big Warmer”, without realising just how true that was. Everyone who met him for the first time warmed to him immediately. He lived his life with a passion that few of us could ever hope to match. In doing so, he brought light into the life of everyone he touched, & his infectious optimism inspired us all. Through his books & his achievements, he will continue to inspire many more than just this present generation. One person he had a profound effect on was Alex Salmond, who he invited to speak at the Wallace Memorial Service in London in 2005. Irene contacted Alex to let him know, & although he can’t be here today, he sent us a letter that he wished to be read out. David Ross was a tremendous enthusiast for all things Scottish and, in particular, for the memory of William Wallace. Among David’s outstanding contributions to the wider understanding of Scotland’s history was his leadership, along with the Society of William Wallace, of the commemorative march to London in 2005. Those of us who attended and contributed to the service at St Bartholomew’s in Smithfield in London experienced an occasion as memorable as a state funeral and as moving as a personal testament. David’s leadership provided, albeit 700 years on, the memorial service to William Wallace that generations of Scots would have wished to see. For this, and his many other contributions to Scottish life, David will be long remembered and the rest of us should be deeply grateful. So it is with you, Davie. Everyone here will carry a little piece of you in their heart until it is their time to be called. Sleep peacefully, my good friend, you have earned your place in the Hall of Heroes. I’m so sorry to hear the sad news. He was a wonderful guy and always willing to help and such a “fighter”. His legacy will live on though – he’s done so much good work he will be remembered for the years to come. That the Parliament notes with great sadness the passing away of the historian, David Robertson Ross, at the age of 51, who became widely known as the Biker Historian as he toured around Scotland from the age of 17 in his quest for a better understanding of the places and events that helped shape our nation. Also, through his numerous works on William Wallace and Robert the Bruce among others, he is credited with bringing Scotland’s vibrant history to a new generation of ordinary people in Scotland and beyond. David’s dream to see Wallace “brought home” for a symbolic funeral was realised in 2005 when, to mark the 700th anniversary of Wallace’s execution, David and supporters carried a coffin containing Wallace’s “spirit” from London to Scotland, and believes that, as he journeys to join his kindred spirits. Mourn now, weep on my countrymen for the man that stood steadfast to passioned principles When few if any would. Call him giant, call him mad or Sir if you will The Wallace and his mighty sword stirs the young hearts still. Originally penned to mark the Walk for Wallace ring true for this giant of a man. I am totally shocked and saddened by David's death. He was a great ambassador for the country he loved and it's so sad that his life was cut short before he could see an independent Scotland which he would have dearly loved. He will be greatly missed by the Society and all who knew him. Maybe he is with the great man himself now, SIR WILLIAM WALLACE that is. Could you please pass on my condolences to the family and to the society. This have come as a great shock to me. I really don't know what to say, just that David will be sadly missed and Scotland has lost a great son. Altho’ we have never met, it is with personal sadness that I rec’d this news on Sunday night. Yes David was indeed a “giant” whom I had great pleasure in encouraging with support in his writing as did both our late mutual friend the late Nigel Tranter in whose footsteps he followed. It is sad news indeed and quite a shock, please pass on my sincere condolences to David's family and friends, Robert (Rabbie ) Dudgeon. I was so sorry and shocked, to hear of David's sudden death. He has left behind some poignant memories and his ability to touch the hearts of Scots all over the world will be his memorial. His vast and intimate knowledge of Scotland's history, his irrepressible spirit, his courage and humour will forever be remembered. His books were skilfully written in a manner all could relate to and the words on the pages could not but help renew the flame of patriotism to everyone who read them. His epic and real-life Walk for Wallace from Robroyston to London was a voyage which he undertook with typical tenacity and gusto - having put in months of rigorous training, he knew he would be pushed to the limits. I had the opportunity to assist in the London arrangements for the Walk and Coisir Lunnainn had the honour of singing at the memorial for William Wallace at the Church of St Bartholemew the Great at Smithfield, and was proud to be asked to make the presentation gift for David from the Society of William Wallace to mark this remarkable achievement. He will be long be missed and remembered as one of Scotland's true patriots. Our sincere condolences to family and friends. It was with great sadness that I read the news, it is still with heavy heart that I send this. David was not just a giant in stature he was a giant fighter for Scotland!s ultimate right to true patriotic free independece. I amongst the many others shall miss him greatly, I am sure it is his wish that the "Society"continues to keep history alive of our great wee country and keep it in the forefront of true Scots minds. I only hope his passing was a peace full one? David is best known for his books on William Wallace, Robert the Bruce and Bonnie Prince Charlie. His unique style informed and educated the reader not only about the subject, but also how to travel to the sites connected with them. With his trusty large motorbike he travelled Scotland, England, Ireland , Italy and Spain in his research to fill those books . His broadcasting and speaking career took him regularly to Canada and the United States as well as the UK. Fire and Sword`s first ever public engagement was to support David`s first book "On the Trail of William Wallace" (Luath Press) at the Burn Braes , Biggar, South Lanarkshire and subsequently were pictured on the back of his next book "On the Trail of Robert the Bruce". David always promoted Fire and Sword wherever he went and we are truly indebted to him for his patronage. We will treasure our time with David over the last 15 years and in particular our first gig at Biggar and our last one with him in East Kilbride last November. David...it`s been a blast ! You are the bearer of sad news indeed, Scotland can ill afford to lose people of the calibre of David . It is the mark of the impression David left with folk that I first heard of his death a couple of days ago via clan associations in Nova Scotia . He was, among many other things, a prolific writer & researcher and has left a great legacy of knowledge about Scotland`s Guardian. Oh my God Duncan. I am completely stunned!! I had a good chat with Davie about a month ago and he mentioned then that he had been having problems with his health. Are you able to give me any details? Was he still in Scotland? I know he was planning to go to the US with Kimmy after the new year. Poor Kimmy? I know you will be gutted yourself. May and I will be at the funeral - weather permitting. My heart is heavy and my spirit is sad, another great Scot has been taken away from us. We will never forget David’s passion about the rich tapestry of Scottish history, and his great sense of humour. I’m sure God has a special place in heaven for him and will enjoy the company of this wonderful man. I am sorry to hear of David's death, please convey my feelings of sympathy to his family and other members. I was immensely sorry to read that David Ross died. I am a New Zealander with strong Scottish ancestral links but had no knowledge or understanding of Scotland. Two years I set out to seek the history behind the lives of my forebears beginning with David’s books. They were perfect for my purpose and I wish I had taken the opportunity to tell him so. His passing is an enormous loss to so many around the world for his charisma, passion and communication which shine through his writing. What a FANTASTIC tribute site and a fitting memorial to David, especially for those of us whose lives he touched through his books. It is a delight to read the thoughts and memories of others who knew him well giving us an insight into the character whose writings imparted knowledge and passion for Scotland. I feel humble being a small part of this. I wish Kimberley well in the production of David's last book and look forward to seeing it on my bookshelf. He's walked many a weary mile"
"Why would he speir wie me?" Was to see Scotland free!" And would really make his day!" For I would have him near." For this will take some time." You've surely earned your place." With passion, he fought for the freedom of Scotland. For our People to walk with pride, and rejoice in our Nation. To London he came, to bring back Sir William to his rightful home........Scotland! He championed all the brave Scots of the past, so that future generations of Scots would not forget their history and heritage. He was a man who lived and breathed Scotland. How he stirred us on. He was the leader for us all. And we will always remember him. David R. Ross......our own William Wallace. Why have you been taken away from us? 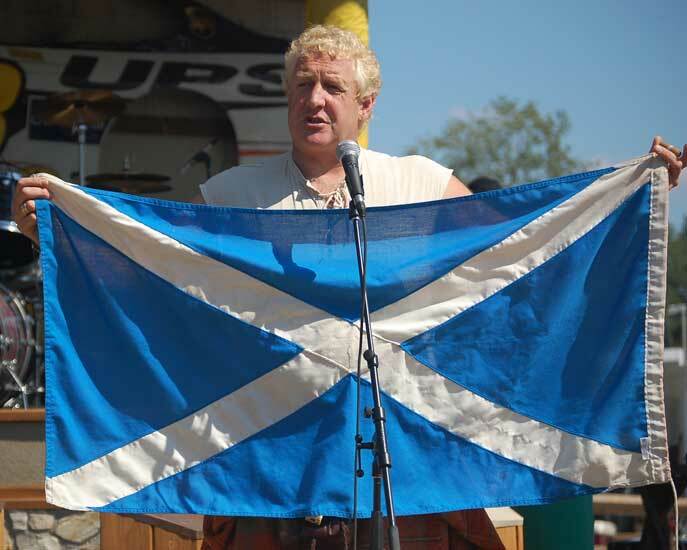 We have heard David speak at the Fergus Scottish Games in Fergus, Ontario. our family especially our two children(ages 12 and 14). Stricken by grief and despair they gathered. Against blustering winds and pelting rain they huddled together staring into the open grave. Sky, was the first to break their silence, " He bore us in his heart wherever he trod." Sobbing, Ocean, piped in. "Yes, yes, and he always spoke of us with warrior-like conviction." The moors, entangled in sweet fragrant heather chorused in next, " He was absolutely resolute in his National pride." Majestic mountain, Ben, clearing his throat added, " Our Scotland, free and independent of tyranny and oppression, was his Scotland. Our son declared this without compromise." Rocking side to side soothing herself, Loch, spoke tenderly of her son's abiding legacy. As silence again enfolded the mourners, the bagpipe droned its tearful dirge to honour the dead. Who now will be our voice?